The Greater Tulsa Indian Art Festival is proud to announce Dr. Jim Halsey as Honorary Chair for its 30th Anniversary, Feb 10-12, 2017. Halsey has presented country music performances all over the world -- in many places for the first time. He has expanded the horizons of country music globally, while maintaining one of the most highly skilled and motivated booking and management companies in the world. In 1999 The Cherokee Honor Society presented Halsey with their prestigious "Medal of Honor" during ceremonies at the Cherokee Nation Capitol in Tahlequah, OK. Jim has served on the board for the Five Civilized Tribes Museum, and currently serves on the boards of Cherokee National Historical Society, Will Rogers Memorial Foundation, and the National Music Council. He was inducted into the Oklahoma Hall of Fame in 2015. 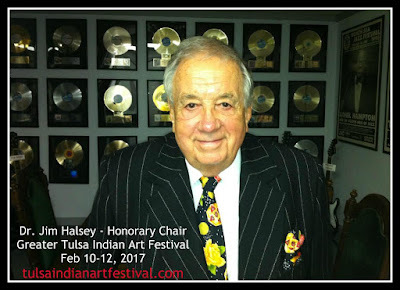 Jim Halsey's career spans over 65 active years as artist manager, agent and impresario, discovering and/or guiding the careers of such illustrious personalities as Roy Clark, The Oak Ridge Boys, Waylon Jennings, The Judds, Reba McEntire, Minnie Pearl, Clint Black, Tammy Wynette, Mel Tillis, Merle Haggard, Dwight Yoakam, The Judds, Lee Greenwood, Hank Thompson and many others. This year, he celebrates 43 years as the personal manager for The Oak Ridge Boys. Jim Halsey's eclectic tastes have also enabled him to represent such diverse artists as Woody Herman and his Thundering Herd, James Brown, Roy Orbison, Rick Nelson, The Righteous Brothers, Leon Russell, The Glenn Miller Orchestra and others. Halsey's focus the past several years has been directed toward education. He created and served as director of the award-winning Music and Entertainment Business Program at Oklahoma City University in Oklahoma City, OK. Additionally, Halsey has lectured and taught extensively at colleges and universities around the world, and was a Visiting Professor at HED Music College in Yehud, Israel. Premiere Night is Friday night, Feb 10 @ 7 pm. This is an RSVP Event: $100/ticket or $750/table (you have the option for a Festival artist to be seated at your table). The Art Market will be open to attendees. A primary mission of the Greater Tulsa Indian Art Festival has always been to provide scholarships to Native students.